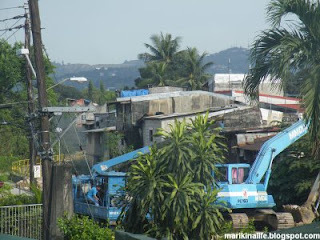 The Balanti Creek, which is more popularly known as "Sapa" separating Marikina City from Cainta is currently being dredged. Part of the bike lane along Green Street in SSS Village is now occupied by some heavy machinery to clean up parts of the creek and remove any hindrances from waterflow. The bike lane (yellow grills in the photo) which follows the curvature of the creek starts from Sumulong Highway and ends at Lilac street near Soliven. 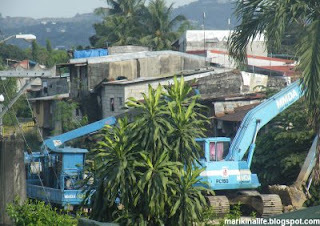 During rains, this creek is one of the main water passages leading rainwater from out to Marikina River. Hopefully, this will reduce the chance of any flash floods during the rainy season.